Time for a a little bit of an embarrassing admission: I've never seen Chocolat. I haven't seen The Cider House Rules either, well at least not all of it though I can recall starting it about a half dozen times. What I can say is I distinctly remember being in the eighth grade and my art teacher trying to convince me that it would be a more rewarding experience to go see Chocolat than Vertical Limit, which I was clearly anxious to see and would choose over an artsy film any day of the week (it had Robin in it!). Needless to say, all this time later I still haven't made time to visit director Lasse Hallström's well-reviewed romantic drama starring Juliette Binoche and Johnny Depp that would seem to make the most pleasant double-feature with his latest film, The Hundred-Foot Journey. If we're being honest though, there wasn't a large amount of interest in this film for me, a 27 year-old who was more excited to see Teenage Mutant Ninja Turtles than an adult drama about the vast difference in cultures and their respectable inclinations even when a minuscule distance separates them, say a hundred feet? The Hundred-Foot Journey is a film no better described than being purely pleasant. It is a movie that could easily pass a weekend afternoon and be completely satisfying in doing so. 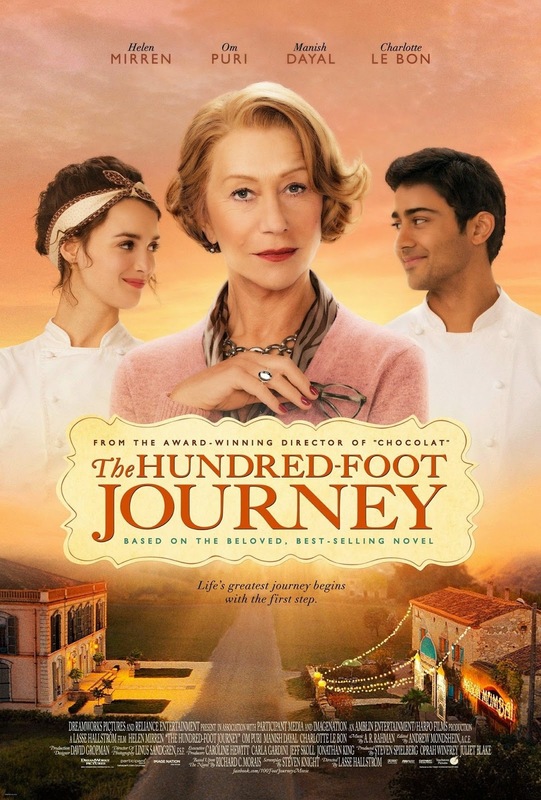 There is nothing inherently wrong with a movie like The Hundred-Foot Journey, but it is to be understood going in that it is nothing but insubstantial froth. It is the dessert to a lazy, stress-free weekend or even the bubbly anecdotal answer to a demanding or trying couple of days. Either way, most will receive the same feeling from this slightly high brow Hallmark movie in that it paints a world where the outside conflicts of our existence never enter into the picture and the small trials and tribulations of our characters, while certainly major in their lives, leave little worry with the audience because we know exactly where things are heading and how *pleasantly* they will all turn out. 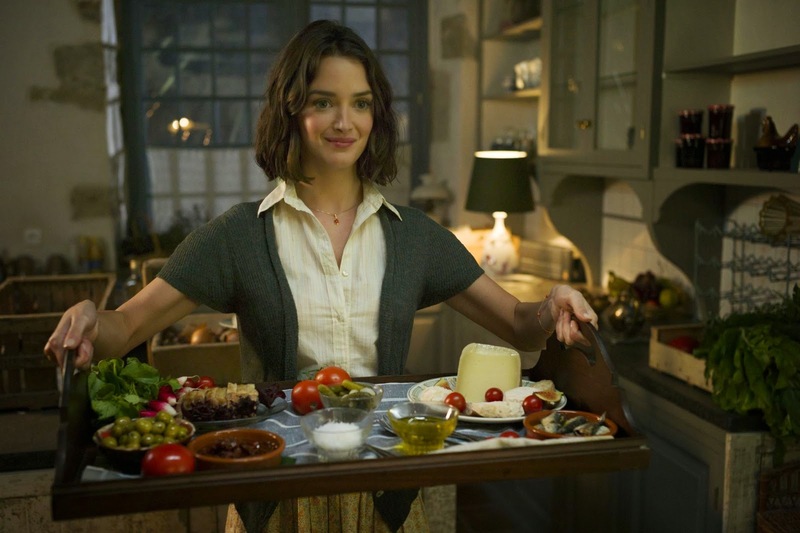 Marguerite (Charlotte Le Bon) serves her new guests some freshly-picked foods. We begin in Mumbai where the Kadam family prospers with their popular restaurant until one night, an election night of some kind, there was a winner and a loser and as the winner dined at the Kadam establishment it was attacked by rioters from the opponents supporting team. Their restaurant is lost in a fire as their matriarch is caught in the kitchen, unable to escape. This strikes the rest of the family, including the Papa (Om Puri) and their five children Hassan (Manish Dayal), Mansure (Amit Shah) Mahira (Farzana Dua Elahe), Mukthar (Dillon Mitra) and Aisha (Aria Pandya), in different ways but it takes an especially strong toll on Hassan who formed a unique bond with his mother through the craft of cooking. It is a craft he continues to take seriously after her death and strives to become a valid cook despite the families move to London which they find simply too cold and not fitting for their style or an environment fit to cultivate the ingredients they need for their food. In light of these realizations the family then picks up and moves to the French countryside (settling in the small town of Lumière only after their brakes give out and they take it as a sign) where Papa decides to purchase an out-of-business building that is right across the street from a traditional French restaurant run by the ruthless Madame Mallory (Helen Mirren). The small, hundred feet that divides the two restaurants is of course the symbolism for two vastly different cultures that have different ideas about the necessities of life. Madame Mallory revels in the subtleties of French cuisine and a simple life in the countryside while Papa Kadam is audacious both in the way he lives his life and the way he likes his food. It is the boiling rivalry between the Madame and Papa that is the starting point for the film, but this is really meant to be Hassan's story and how his yearning to learn the culinary arts of various cultures will bring peace between the two stubborn elders and their establishments. The film wants to place an emphasis on the melding of the styles of cooking in which Hassan operates that lead his character arc to becoming a well-renowned and innovative chef-that is what it wants to do. The problem is, the film itself has trouble remembering to stay on track with this story and ultimately allows for the surrounding circumstances to distract from the main throughline of the narrative resulting in an overlong third-act that feels like it's playing catch-up. We actually reach a certain point in the film where I believed it was coming to an end because there was an agreeable conclusion to which the credits could roll with maybe one or two more scenes to tie up any character strands left, but instead the film went on for nearly a half hour more. This final half hour or so of the film is a total attempt to give a more well-rounded view of Hassan's character arc, but instead comes off as slapdash given the fact we spent so much time in the budding rivalry of French vs. Indian and then the convergence of Hassan into Madame Mallory's world so that he might become a more eclectic chef bringing peace and understanding to the situation. That would have been fine, to simply keep the story bookended by Hassan's ambitions being set as a child and then him actually realizing those by the ending where he goes to Paris to cook. Instead, the film feels it has to bring Hassan's journey full circle and in doing so makes the film overall feel as if it has three too many endings. Not to mention, it undercuts the romantic aspect of the story involving Charlotte Le Bon's Marguerite and the confusion as to whether she resents her feelings towards Hassan or if she just needs to know that he's actually a better chef than her. I imagine there is a lot more to these characters in the Richard C. Morais novel as there are hints of a more flushed out history to each of them. This especially goes to the point of the under-served romantic angle as we understand that Hassan is interested in Marguerite from the get-go for their kindred love of cooking, but that she is hesitant because of the sharing of their profession. When feelings continue to develop though and Marguerite believes Hassan is undercutting her to become the head chef at Madame Mallory's we understand the tension, but we don't get a full resolution except for a tacked-on hug and an agreement to settle the score. We understand her position, but we don't particularly like Marguerite and as for the rest of the characters, besides Madame and Papa, we don't really care. It is somewhat hard to say that about Hassan given he is at the center of all of this (despite the fact the marketing campaign would have you believe it to be Mirren's character) and I don't know that there is much more Dayal could have done to make us really take to Hassan, but we know where things are heading so we know he'll be fine and thus don't become as invested in his journey. His siblings are hardly given anything to do except stand on the sidelines and watch as one of their own is heavily favored (which you would think might create some resentment, but nothing of the sort is hinted at here). The most entertaining scenes are those that involve Mirren and Puri whether they be butting heads with one another or developing sensibilities for one another that result in the most complex emotions and strides any characters feel or take in the film. Clearly, Mirren is the star of the piece, but it is not her character's story-she only serves as a function in the bigger tale of a boy from the gutter rising quickly through the ranks to become a world-famous chef. The movie seems to forget this though which leads to problems in pacing and development, but does little to hinder what little substance it can muster.